Thanks so much! I really loved the video! It was made in 2 days, so I didn't have time to get a different font, and leave a mark is italicized in the desc because that was the theme for the jam! Glad you enjoyed it! Thanks, I didn't even know what panspermia hypothesis was before this! Sweet little game. Even had a nice difficulty curve to it. I also found myself just shooting the trees at full power, perhaps if there was some gravity to the planets it would be more fun to shoot slitghly less charged trees and see how they orbit the planet before landing on it :P.
I had that on my TO-DO list, but I decided to do more important things first, as that would have taken a while! I had fun! I like the game mechanic, even after I got the hang of it I had fun challenging myself by trying to hit planets as quickly as possible. Plus the idea of terra-forming by shooting trees through space is hilarious! Thank you so much for playing! When I play it I'm also in the habit of charging to full power, and aiming directly at planets! Very interesting mechanics, I am curious about a story backig up this scenario. How can I see how many trees are left? It seems that the best strategy sometimes is just to shot straight up and hit a planet many screens away. Aww. i thought i was the first to realise this. As frodewin said, i just kept firing straight up skipping multiple level with one tree. I'd love a counter to see how many trees i have left, kind of taken by surprise when the game ended. In the bottom left, you should see your score and how many trees you have left. Try full-screening the game. Sadly, I didn't really have time to come up with a story (I just added on in the desc of the game), but I'll try to do one next jam. I do know about the "cheat", but it's not really that much of a cheat as your score isn't how high up you are, but how many planets you've saved. Although it still is easier to not really have to aim. Thanks for the feedback! Thank you, tried it out in full screen and now that I see the remaining trees it is much easier. The number of saved planets is also very motivating. Thanks! 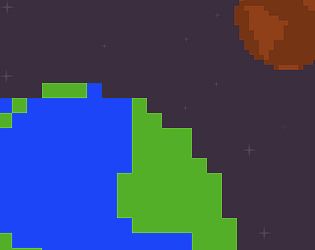 I also just added a post-jam version, with a story in the description, made the planets shrink more, and made it so you can't shoot straight up and randomly hit something! I really appreciate the feedback!